The three former political prisoners are: worker Viktor Pestov, convicted for anti-soviet activity; literary scholar Mikhail Meylakh, sentenced for keeping forbidden literature in Soviet times (Nabokov, Mandelshtam, Solzhenitsyn); human rights activist Sergei Kovalev, convicted for working on a weekly publication on Human Rights in the Soviet Union. In Kachkin's documentary, each recalls the story of their arrest and imprisonment in the “Perm-36” prison camp. In 1996 Russia’s only museum of the history of political repression was opened in the former camp, on the initiative of historian Victor Shmyrov. Since 2005, every summer an international civic forum “Pilorama” has been held at the museum on the theme of human rights: discussions are held as are concerts, tours, film showings. Participants (democrats, liberals, communists or simply tourists) live in tents in the field opposite the museum. Film screening in Russian with English subtitles. Discussion in English and Russian. Moscow-born British author Zinovy Zinik lost his Soviet citizenship in 1975 and arrived in London via Jerusalem in 1976. Zinik’s eight novels, six collections of short stories and numerous essays dwell on the dual existence of bilingual immigrants, religious converts, political exiles and outcasts – from habitués of Soho to Russian mushroom pickers in Aldershot, to displaced Lebanese refugees in Vienna and the sect of Jewish Muslims in Istanbul. His novel Russian Service as well as many of his short stories have been adapted for radio and his novel The Mushroom Picker was made into a film by BBC TV (1993). Zinik is a regular contributor to the Times Literary Supplement and BBC radio. Among his recent works are the novel in English Sounds Familiar (2016), the novel in Russian The Orgone Box (2017) and the book on Shabtai Zvi Yarmulkes under the Turban (2018). 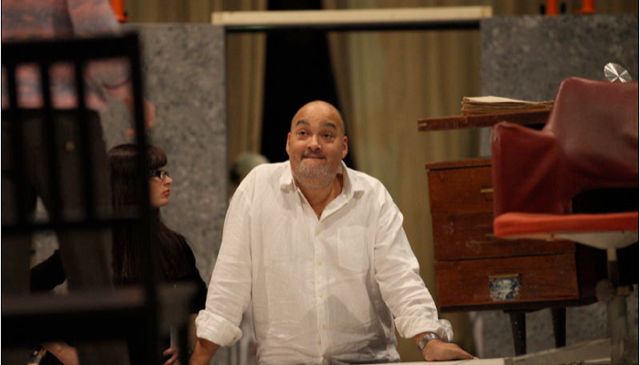 Michael Hunt is an international theatre and opera director. In 2012 he was awarded the Perm State Prize for Culture in recognition of his work in Perm, including to date FIDELIO in Perm 36, Stoppard’s EGBDF and JESUS CHRIST SUPERSTAR at the Drama Theatre, PETER PAN and CHRONICLES OF NARNIA at the Theatre for Young Spectators. He served as Artistic Director of the touring opera company Co-Opera in Ireland for 12 years as well as periods as Chief Executive of the Wexford Opera Festival and Artistic Director of the Theatre Royal in Waterford. His productions have been seen in UK, Ireland, USA, France, Italy and the Faroe Islands. He is a member of the advisory panel for theatre for Coventry2021. In 2017 he was the principal guest speaker at the EU-Russia Civil Society Forum in Gdansk. Charlotte Skene Catling is an architect. She uses research as a basis for design, with a particular interest in the borders between architecture and other disciplines. She takes a unique approach to practice which she terms 'Geoarcheology', seeking to excavate meaning from context as a means of developing architecture. This method sees her taking observations about the composition of the earth, historical artefacts and the cultural landscapes of her commissions. She designed a series of site specific installations for Michael Hunt's production of FIDELIO in Perm 36. Charlotte has written about architecture in The Burlington Magazine, DOMUS,The Architectural Review and ARCH+. She launched the architectural film festival, ArchFilmFest, in London in 2017, and has made architectural films that have been shown around the world. She ran a post-graduate architecture unit at the Royal College of Art for five years and taught at the Karlsruhe Institute of Technology (KIT), Germany. She is an Ambassador for the London School of Architecture, and is currently completing a research project with the Royal College of Art and the Rothschild Foundation on representation in architecture. Her practice, Skene Catling de la Peña, has won numerous awards and has been published internationally. She was the only European shortlisted for the 2016 AR Women in Architecture award, and was named a Debrett’s 500 People of Influence in Architecture & Design in 2016 and ‘17.